Each year, Move-In Week proves to be one of Grand Canyon University’s most popular events, and this year will be the biggest ever. With nearly 9,400 students moving on to campus, triple last year’s head count, GCU is asking for help. The University needs 300 faculty and staff volunteers to join the “Welcome Crew” to greet new and returning students and their families, direct them to their respective dorm rooms and help more than 800 student volunteers haul luggage from cars into the University’s 14 residence halls during “Express Move-In” time slots. Three halls will be filled each day, beginning with Acacia, Canyon and Ironwood on Monday, Aug. 17. 300 faculty and staff volunteers are needed to help haul luggage from new and returning students’ cars to their dorm rooms during Move-In Week, Aug. 17-21. This year, Move-In Week has been extended to a full five-day week to accommodate the influx of new students, in addition to returning students for the first time. Faculty and staff can register for full-day (about seven hours) or one-hour time slots from 7 a.m.-1 p.m., Aug. 17-21. Volunteers should plan to come to campus around 6 a.m. to help direct traffic. Employees are asked to check with their managers to arrange for the time to volunteer. Jeremy Mack, director of student engagement, said Move-In is a tradition designed to introduce new students to the “Lope way” from their first day on campus. “For faculty and staff, Move-In is a way to show support to all of our incoming and returning students because, truthfully, we wouldn’t be here without them,” Mack said. Volunteers are asked to wear comfy clothes, sturdy shoes and smiles. They also are asked to prepare to climb stairs and carry heavy luggage, including TVs, suitcases and the occasional mini fridge. Breakfast, lunch, purple shirts and plenty of water will be provided. For employees still on the fence about volunteering, take a look at Bill Yearnd, Move-In all-star. 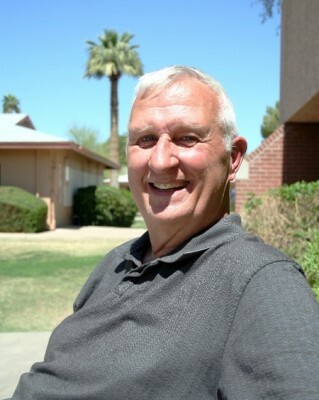 GCU technical support specialist Bill Yearnd will volunteer at his fifth-straight Move-In this year. Yearnd, a GCU technical support specialist, will volunteer at his fifth-straight Move-In this year. He drives the beverage cart and hands out waters and Powerade to parched volunteers, students and their families. For the 14-year GCU veteran, Move-In is a tradition and one of the most exciting times of the year. If you still aren’t convinced to volunteer and continue the GCU tradition, Mack has a few parting words for you: Move-In will be an event you won’t want to miss. For more information on Move-In, email charity.norman@gcu.edu.